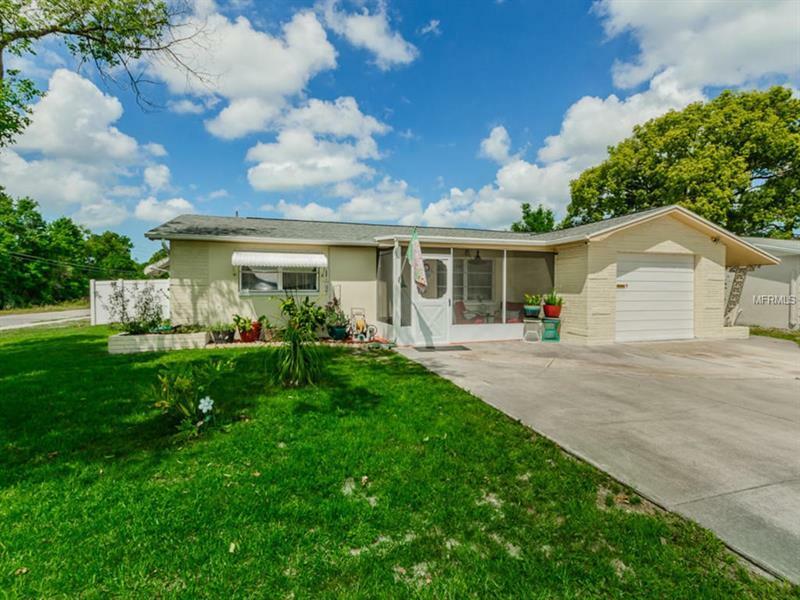 Come take a look at this meticulously maintained 2 bedroom 2 bath 1 car garage home in Holiday Lakes Estates on a spacious corner lot. This move-in ready home offers 1338 heated square feet with a Den/Bonus room and an air conditioned 13 x 12 Lanai. The kitchen features a tubular skylight for extra natural light and a new LG Black Stainless Steel Refrigerator. You’ll love the screened-in front porch extra wide driveway large enough for 3 cars and a new Tuff Shed that was installed last April. The back yard is completely fenced in with double gate on the side for easy access. The sellers have just replaced the roof in March with CertainTeed Landmark Premium shingles; new 16-Seer Goodman HVAC system in September of 2018 as well as new Maytag Washer and Dryer. This home is perfect for first time home buyers looking to stop renting and for the snowbirds tired of the cold winters. You are minutes from Anclote Park to launch your boat Fred Howard Park Tarpon Springs Sponge Docks dog parks and so much more!